Pity the Flash, one of the few major superheroes to leap to the big screen – so far, at least. IMDB indicates a Flash movie will hit multiplexes in 2018, so apparently the character will enjoy that exposure before too long. In the meantime, the speedy hero gets his own TV series. We examine The Flash in this “Complete First Season” Blu-ray set. The package includes all 23 episodes from the show’s initial year. The synopses come from IMDB. My screening of The Flash comes pretty hot on the heels of my time with Season One of Gotham. 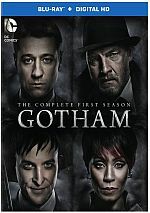 I’m far more attached to Batman than I am to the Flash, and I enjoyed Gotham so much that any other DC Comics-based series seemed likely to come up short by comparison. While I doubt that I’ll like The Flash as much as Gotham, at least the “Pilot” gets it off to a pretty good start. I think it owes a little too much to Sam Raimi’s Spider-Man - down to the hero’s magical development of muscles – but “Pilot” manages to pack a lot of exposition into a reasonably entertaining program. Though I’m not sure how deep into the Flash’s backstory I’ll commit, the series does offer pretty good action and excitement so far. That’s where “Alive” excels, as the sequences in which Barry battles the baddie fare well. If the thematic/character elements catch up, this will become a quality show. As with prior episodes, “Outrun” works best when it focuses on action, as the thematic/character elements don’t fare that well. Because “Outrun” lacks as much action as its predecessors, it becomes less engaging than I’d like. Curious casting footnote: Carrigan plays Victor Zsasz on Gotham. It seems odd to use the same actor for two different roles on semi-related series, especially given how distinctive Carrigan looks; the guy’s not exactly a chameleon. While I like that we finally meet a villain who’s not a “meta-human”, it seems like Captain Cold offers a fairly tepid threat. No matter how hard the episode tries to sell a guy with a freezing gun as a danger, I just don’t buy it. The Flash should be able to nail Cold and end the problem right away. That side of things makes “Rogue” a less than terrific show, though I guess I’ll have to suspend this disbelief since Cold will play a fairly prominent role in future programs. I like that “Plastique” introduces a meta-human who doesn’t pursue evil. However, that becomes arguably the episode’s only real strength. The show feels sappier than I’d like and doesn’t really go anywhere. S1 rebounds fairly well with “Born”. The episode’s villain presents an interesting backstory and provides reasonable action. I wouldn’t call it a great show, but it satisfies after a couple of lackluster programs. As I’ve mentioned before, The Flash works best when it accentuates action, and that helps make “Outage” a strong show. 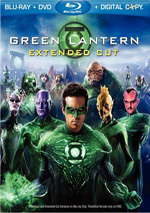 It boasts a mix of villains and presents interesting twists, especially when Barry loses his powers. "Outage” probably turns into the series’ best show to date. Flash already offered some crossover with Arrow in two prior episodes, but “Vs.” does so more actively. Though this feels like a gimmick, “Vs.” works, largely because it offers good excitement as well as character/plot advancements. I don’t like it quite as much as “Outage”, but “Vs.” turns into a solid show. “Suit” delivers a mixed bag. On one hand, I like the developments in the Reverse-Flash plot, and those add both intrigue and excitement. However, the side with Caitlin works less well, largely because Danielle Panabaker can’t act. She damages any scene in which she needs to show actual emotion, which makes her arc less successful. At least as depicted so far, I still think Captain Cold is a mediocre super-villain since he remains a dude with a gun, but I do realize this comes straight from the comics, so I can’t criticize the series’ use of him. Besides, it’s fun to get a Flash foe who isn’t a meta-human, especially since Miller gives us a delightfully arch portrayal of Cold. “Revenge” doesn’t excel but it becomes a mostly enjoyable show. By the way, what’s with the series’ obsession with Prison Break alumni? In addition to Miller and Purcell, Robert Knepper appeared in “Power Outage”. Nothing against those actors, of course, but it seems odd so many of them show up in The Flash. Wells has been the series’ slipperiest character, and “Fury” manages to open that narrative a bit more. Pied Piper also offers a decent villain. Despite those positives, “Fury” lacks the zing I’d like to see and feels a bit flat. To a certain degree, The Flash lives or dies with its villains. That makes “Crazy” a less than enthralling show, largely because Peek-A-Boo offers a fairly blah baddie. Some moments still work fine, but the show as a whole lacks zing. Try as I might, I just can’t take much interest in the Ronnie story. Maybe that’s because it heavily involves the ever-boring Caitlin. At least the investigation into the murderer of Barry’s mother becomes more compelling. With “Fallout”, we find some of the same strengths and weaknesses as “Nuclear”. The Ronnie side still drags, but I like the murder investigation, and Garber proves enjoyable as Dr. Stein. Despite the weak elements, “Fallout” still offers a fairly good show. Except perhaps for the “Pilot”, “Time” presents S1’s most significant episode to date. In addition to some good action, it comes with substantial revelations and the apparent death of a major character. “Time” turns into a terrific program. I’m glad I said “apparent death” when I discussed “Out of Time”, as “Rogue Time” reverses that immediately. I should be mad that “Rogue” negates much of the prior show’s drama, but it does so in a clever manner. While less dramatic than its predecessor, it still entertains. The Trickster feels more like a Batman villain than one who fits the Flash’s universe – at least as depicted in this series – but the episode works pretty well nonetheless. A lot of that comes from Hamill’s campy but effective performance. Sure, those scenes borrow a ton from The Silence of the Lambs, but they’re enjoyable anyway – and we even get an amusing quote from one of Hamill’s most famous movies. Though it advances some of the season’s global narrative elements, “Team” sags over all. I like parts of it – the crossover with the Atom can be fun – but the show lacks a lot to make it compelling. Kinney’s iffy performance as the “Bug Eyed Bandit” doesn’t help. “Wells” works fine for a while, but at its mid-point, it requires Barry to be impossibly stupid. Whatever positives the episode brings, that plot device stretches credulity to the breaking point -–and about 3000 miles beyond it. The parts that move along the narrative satisfy but the parts with the shape-shifter falter, partly due to that idiotic story choice. Flash functions as something of a “reverse-Gotham”. The latter series fares best when it concentrates on its overall narrative, while Flash seems most interesting when it offers a Villain of the Week. Not that I dislike the overarching story points, but they don’t seem all that fascinating. Since those components dominate “Trap”, the show leaves me a bit cold. The season rebounds here, as Grodd offers one of Flash’s most interesting opponents. The gorilla gets a good introduction, and those moments mix with the overall narrative in a satisfying manner. All the different elements combine well in the fun and satisfying “Air”. I continue to enjoy Captain Cold, and the addition of his catty sister adds entertainment as well. We head into the final episode on a high. Season One finishes on an emotional note. Parts of it stretch logic, but the choices work out in the end. “Fast” concludes S1’s overall narrative and sends us toward S2 in a compelling – though cliffhanging - manner. The Flash appears in an aspect ratio of approximately 1.78:1 on this Blu-ray Disc. The series offered positive visuals. If you suspected Flash would come with the modern standard teal and orange palette, you’ll get what you expected, though not to an extreme. While the flick went with those overtones, they didn’t overwhelm; indeed, the orange bordered on amber. I’d like to see Holllywood dispense with those conceits, but given their restraints, they looked fine here. I also felt happy with the solid DTS-HD MA 5.1 soundtrack of Flash. A TV series won’t boast movie-quality audio, but the shows delivered reasonably involving material. Much of the track maintained a forward emphasis, but action scenes managed to use the back speakers in an effective manner. With the Flash’s running, explosions, storms and other components, the soundscape managed to pack a pretty good punch. Audio quality was also positive. Music sounded lively and full, while effects delivered accurate material. Those elements showed nice clarity and kick, with tight low-end. Speech was always distinctive and concise, too. These mixes worked well for the series. As we shift to extras, we find an audio commentary for the series’ “Pilot” episode. This track involves executive producers/co-creators Greg Berlanti and Andrew Kreisberg and co-creator/DC Entertainment Chief Creative Officer Geoff Johns. All three sit together for this running, screen-specific look at the series’ origins and development, changes made between the “Pilot” and the rest of the season, story/character areas, cast and performances, sets and locations, effects, costumes, and related domains. The co-creators manage to give us a pretty good look at the series’ roots here. They cover a nice array of subjects and do so in an informative way. It’s too bad we don’t get commentaries for other episodes, as this one works well. Deleted Scenes accompany 16 episodes. We find sequences for “Pilot” (two scenes, 3:55), “Fastest Man Alive” (1, 0:33), “Things You Can’t Outrun” (1, 0:47), “Power Outage” (1, 1:39), “The Man in the Yellow Suit” (1, 2:57), “Revenge of the Rogues” (1, 1:54), “The Sound and the Fury” (1, 1:07), “Crazy for You” (2, 2:00), “The Nuclear Man” (3, 2:35), “Fallout” (1, 1:00), “Rogue Time” (1, 1:56), “Tricksters” (2, 2:30), “The Trap” (1, 2:06), “Grodd Lives” (2, 2:38), “Rogue Air” (2, 1:32) and “Fast Enough” (3, 7:15). That’s a lot of deleted footage – does much of it add material of interest? Yes and no. On one hand, the sequences can be interesting to see in their own modest way. On the other, few – if any – really give us substantial new information. The scenes tend to flesh out characters in a minor manner and not much more. On Disc Three, The Trickster Returns runs eight minutes, 39 seconds and offers notes from actors Mark Hamill and John Wesley Shipp. We get info on the comic book Trickster as well as his appearance in an earlier Flash series and elements of his portrayal here. This offers a quick but entertaining and informative show. The remaining extras appear on Disc Four. 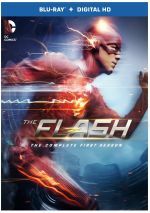 The Fastest Man Alive goes for 30 minutes, 39 seconds and features Kreisberg, Berlanti, Johns, and actors Grant Gustin, Jesse L. Martin, Carlos Valdes, Danielle Panabaker, and Rick Cosnett. The show looks at story/character areas as well as cast and performances. This tends to be a mildly introspective overview but not one with great depth. Creating the Blur: The VFX of The Flash lasts 26 minutes, 25 seconds and provides notes comments from Kreisberg, Berlanti, visual effects supervisor Armen Kevorkian, lead CG artist Stefan Brederck, and compositing supervising editor Andranik Taranyan, As expected, “Blur” looks at various visual effects found on The Flash. “Blur” offers a quick but reasonably good look at the subject matter. Next we find a Screen Test. In this four-minute, 20-second reel, we see Gustin audition along with Emily Bett Rickards. It comes with comments from Berlanti, Gustin and Kreisberg. This shows Gustin’s try-out to play Barry Allen as a guest on Arrow - and thus the lead in Flash. I like the info, but the actual screen test doesn’t get enough exposure. DC Comics Night at Comic-Con 2014 fills 29 minutes, 31 seconds. It gives us a panel discussion with Kreisberg, Berlanti, Johns, Shipp, Patton, Rickards, Martin, Cavanagh, Gustin, executive producers, David S. Goyer, Daniel Cerone, Danny Cannon, Bruno Heller, Marc Guggenheim, and actors Carmen Bicondova, Ben McKenzie, Donal Logue, David Mazouz, Jada Pinkett Smith, Robin Lord Taylor, Stephen Amell, Colton Haynes, Caity Lotz, John Barrowman, and Matt Ryan. This group includes folks involved with Gotham, Constantine and Arrow as well as Flash. The content stays insubstantial and promotional, so don’t expect much from this piece. Finally, we get a gag reel. It occupies eight minutes, 24 seconds and shows the usual silliness and mistakes. For the most part, Season One of The Flash offers good superhero entertainment. It fares best when it concentrates on individual villains, but its overall narrative does fine for itself and helps turn this into a satisfying package of shows. The Blu-ray brings us positive picture and audio as well as a decent set of bonus materials. I look forward to Season Two.